This week has been pretty intense, which you may have gathered by my absence the past few days. I intend to make it up by featuring not just one, but seven of my favorite Fall finds. Need Supply Co. is one of my favorite online shopping spots and their new arrivals do not disappoint. 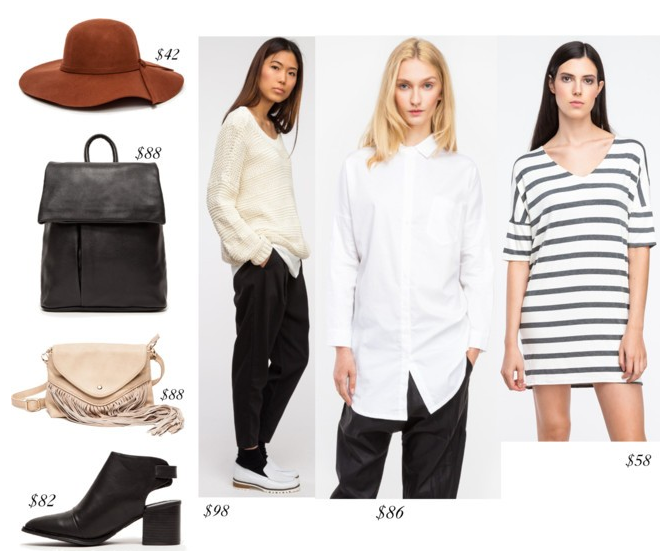 All seven of my favorites are under one hundred bucks and perfect for Fall. Can we talk about the Saunders Ankle Boot for a quick sec? The perfect Fall outfit = A pair of your favorite jeans (or these) + a white button down + these boots. That's as aggressive as I'll ever get with math on the blog. Promise. Another favorite of mine is the Filipa Hat. A wide-brim hat is definitely a key player to have in your closet and this one is especially perfect for just $42. Fall is right around the corner ladies, so start stocking up now. I'm a sucker for a striped dress! This one looks gorg. Hello Need Supply. Striped dress + Hat. Yes. The ankle boots and the purses are amazing picks! I hope next week is better for you.